Every successful artistic project depends on a web of contributors: composers, performers, technical specialists, writers, producers, and more. We love this process, and we love to teach it too. Join us at our 11th SōSI to dig deep on what makes these relationships work. With faculty members Eric Cha-Beach, Josh Quillen, Jason Treuting, Adam Sliwinski, Andrea Mazzariello, and Sarah Kirkland Snider, SōSI takes place at Princeton University, in Princeton, New Jersey, July 14-28, 2019. Percussionists and Composers are welcome to apply! For more information and application instructions please contact Yumi Tamashiro, SōSI Festival Coordinator, yumi@sopercussion.com. Read our “Year in Review” for 2017-2018! Adam Sliwinski has penned a comprehensive year-in-review for the season just ended. Check it out here! On Thursday, September 7th, we joined The National on “The Late Show with Stephen Colbert” to perform “Day I Die” from their new Album “Sleep Well Beast.” What a thrill to perform on national television at the Ed Sullivan Theater! We contributed some typical Sō Percussion color to the new album, which has just been released September 8th. 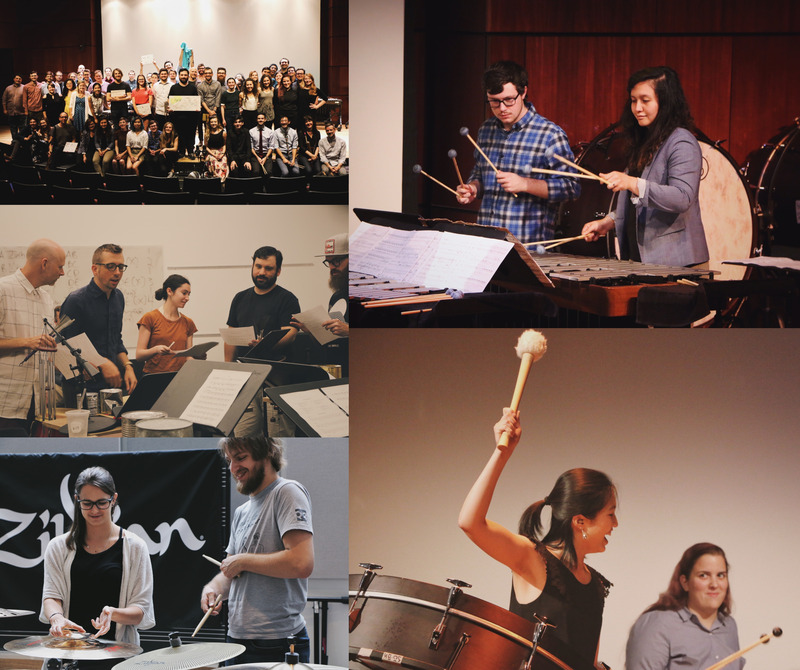 Announcing the Events of the 9th Sō Percussion Summer Institute! Our summer institute (SoSI) approaches! Check out our SoSI page for more information. If you can’t make it in person, most of these events will be live-streamed from Sō Percussion’s Facebook Page: facebook.com/sopercussion. Please Join us for our fourth annual benefit and online auction! If you can’t make it, we’re also running an online auction leading up to the benefit! Performance at the TED conference in Vancouver, BC, February 2016. We were honored and delighted to present an excerpt from Bryce Dessner’s work for the audience at TED 2016. Keeping in line with the ethos of the TED organization and community, we brought this unique piece with its newly designed instruments to show some of what’s going on in contemporary music. Performing in this amazing venue was exciting enough, but we were surprised to realize that some pretty heavy hitters were in the audience as well! Sō Percussion (Where (we) Live, 2012 Next Wave) gives the Second Amendment a soundtrack in this affecting foray into America’s fraught relationship with guns. Taking mallets to disassembled sniper rifles and assorted drums, the musicians serve as Greek chorus, commenting instrumentally on sung and spoken texts drawn from the nightmares and nostalgia of armed experiences. Three-time Obie-winning director Ain Gordon and choreographer and performer Emily Johnson give depth to this probing work in which anger meets inalienable rights, dark memories resurface, and a contested weapon sings a bittersweet song. Check out our amazing project with StoryCorps to collect stories about gun culture and gun violence.